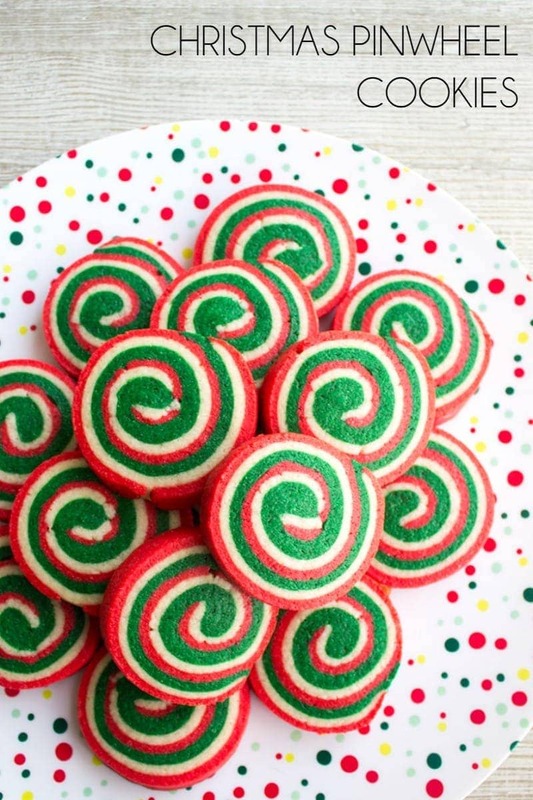 Christmas Cookie Pinwheels are a festive holiday treat that’ll be the star of your Christmas cookie plate! Christmas baking is seriously my favorite time of year. All the fun holiday cookies call my name and I get a twitterpated. Better yet, my boys love to bake with me. We love spending time in the kitchen together. They learn to follow a recipe, practice counting, and their favorite part…taste testing. It’s a holiday tradition in my house and my favorite part of Christmas. I’m not going to lie, these Christmas Cookie Pinwheels take a little time and some love, but what good Christmas cookie doesn’t? While you don’t have to cut out shapes and frost these cookies, like traditional sugar cookies, you do have to do some rolling and practice your ninja baker skills while rolling up the dough. But you’ve totally got this. If I can do it, so can you! Just be careful not to roll the dough too thin and remember to flour everything and often so the dough doesn’t stick to a.n.y.t.h.i.n.g. but itself. 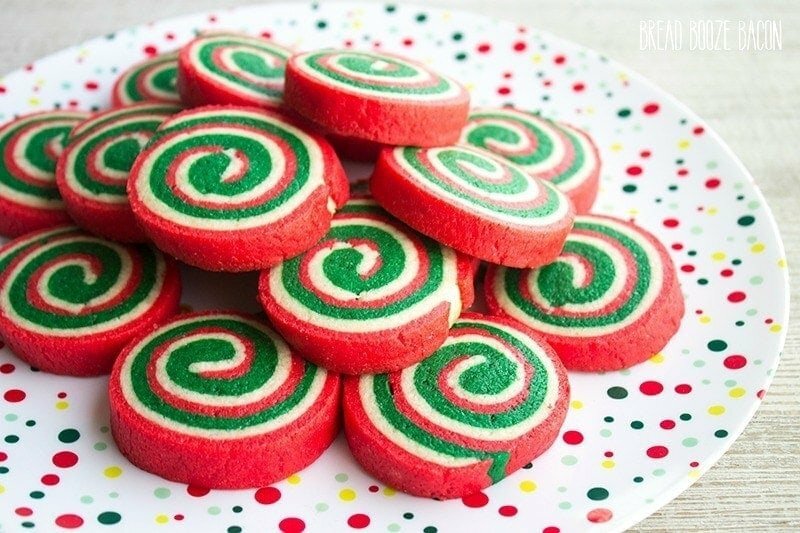 I like to make these cookies in vanilla flavor since my husband isn’t big into peppermint cookies, but if you are, change things up! Add 1 teaspoon of peppermint extract along with the vanilla extract for a burst of fresh minty flavor. 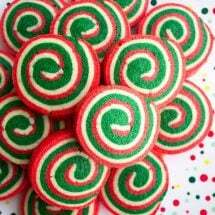 These cookies are so fun and colorful and will make you look like a genius in the kitchen for pulling off such a cool design. In a medium mixing bowl, mix together the flour, baking powder, and salt, Set aside. In a large mixing bowl, beat together the butter and sugar for 1-2 minutes, or until pale and fluffy. Add the egg and vanilla to the butter mixture and beat until combined, scraping the sides of the bowl as needed. Add the dry ingredients to the wet ingredients in two additions, mixing until just combined after each addition. Scrape the sides od the bowl as needed. Place one piece of dough back in the bowl and add the red food coloring. Beat with your mixer until the color is completely incorporated. (Be sure to use a bowl that won't stain.) Clean you mixer paddle or hand mixer blades. Place one piece of dough back in the bowl and add the green food coloring. Beat with your mixer until the color is completely incorporated. Leave the third piece of dough as is. Press each piece of dough into a flat square and wrap in plastic wrap. Refrigerate the dough for 1 hour or until firm. Remove the dough squares from the fridge. Place the red dough between 2 sheets of parchment paper or waxed paper. Use a rolling pin to roll out the dough to a 10-inch square. Leave dough between parchment. Repeat with the other 2 pieces of dough. Refrigerate cookie dough for 30 mins. Remove dough from fridge, and take the top layer of parchment off each sheet of cookie dough. Place the red dough down on a counter. Top with the white dough, non-parchment sides touching. Be sure to try and line up the edges of the dough as much as possible. Remove the parchment from the white dough. Top the white with the green, non-parchment sides touching, being sure to line up the edges. Remove parchment from green dough. 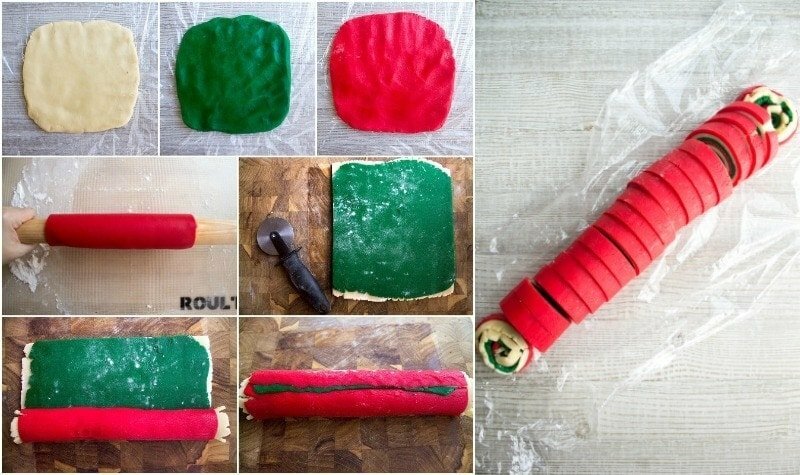 Use a pizza cutter to trim the left and right edges of the cookie dough into straight lines. Very carefully, starting with one of the straightened sides, roll the dough into a long shape until you reach the other trimmed dough edge. Use the parchment paper to lift the dough to get it started. Once the dough log is complete, gently pinch the seam closed along with any breaks on the outer red layer. Wrap the dough log in plastic wrap and refrigerate for 1 hour or until firm. Preheat your oven to 350 degrees F. Line a baking sheet with a silicone mat or parchment paper. Use a sharp knife to cut the dough log into 1/4-inch thick slices. (Discard the ends since they don't make a nice pinwheel design.) Place the cookies on your prepared baking sheets and bake for 12 to 15 minutes, or until the cookies are set. Carefully remove from the oven and let cool for 5 minutes on the baking sheet before transferring to a wire rack to cool completely. Serve immediately or store in an airtight container until ready to serve. I wanted very vibrant colors so I used a lot of food coloring. You can start with 1/4 teaspoon for each color and add 1/4 teaspoon more at a time until your desired color is obtained.If you are using gel food coloring, you will not need nearly as much. Start with a few drops, mix, and then add more color as needed. Did this with my granddaughter. It was great. I demonstrated with 1/3 of the dough and she took over each step as we went. The looked and tasted great. We did roll them in nonpareils before slicing and baking. Even her brother was impressed! What’s the difference between using a gel food coloring and a liquid food coloring?? The gel is thicker and more vibrant. Thank you! and thank you for your feedback. This recipe seems great so far and was pretty easy, but I didn’t get anywhere near enough dough to make three 10 inch squares. Do you have to triple the recipe to get that amount? No need to triple the recipe, but you may need to roll the dough out thinner. These turned out so spectacular! They dress up a plate of varied Christmas cookies. I used gel colors to make them vibrant. A little time consuming, but so worth it! Thank you Mary and thanks for sharing your feedback. Not only do these cookies look amazing, they taste DELICIOUS! I used 1 tsp of food dye for each color, and they look perfect. Before baking, I rolled the outer edges of my cookies with christmas sprinkles to give them some extra holiday flare. Will definitely be making these again, and again, and again! Thank you Allie. Glad you loved it. For whatever reason (too much flour) the outer roll of dough pulled away as it was baking. With the second batch I very lightly brushed the green with a little milk before rolling. Perfect! Hi Cindy, I love that you were able to make it work for you! Time consuming to make but in the end it is a pretty design and nice tasting cookie too. Thank you Brittany and thank you for stopping by! Hi Megan, Sorry the recipe didn’t work out for you, but thanks for sharing your feedback. You can use dental floss to cut the slices. This helps to not flatten the roll when cutting. I turn my roll once when it is in the fridge to prevent 1 very flat side. Then when ready to cut cookies, gently roll and shape it a bit to get rid of any flat sides. I like the paper towel tube idea. Great idea Pat! Thank you for stopping by! I followed the recipe exact and it was super crumbly. When I rolled it. It just tore and broke every where. I took my time with each step and put a lot of work in these and they didn’t turn out. Partially due to the crumbly fall apart dough. I’m sorry to hear that Cori. Is it possible that you left out an ingredient? Or that you are at a high altitude? I made these for the first time today! They look marvelous and taste Great too! 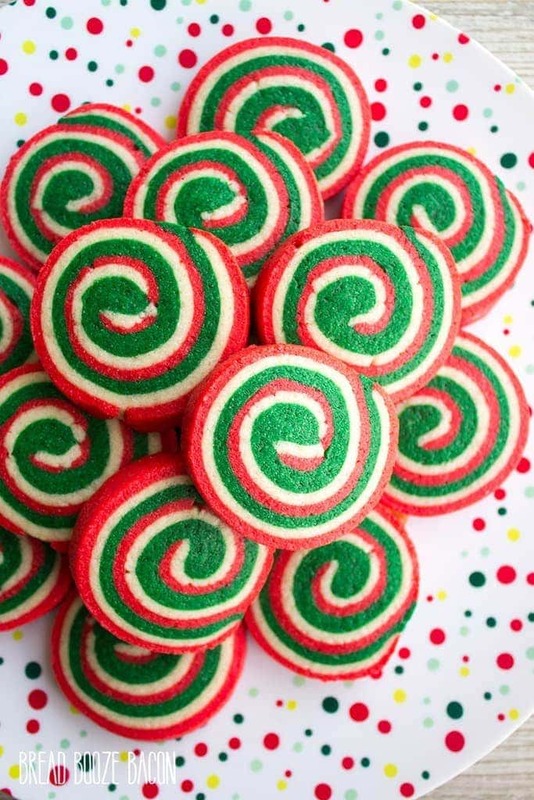 These will be on my cookie tray every Christmas!! Thank you Kim! So glad you enjoyed it! Can I make the dough in advance and freeze? Yes, you can roll, wrap, and freeze. Let it defrost in the fridge before slicing. I didn’t see how many cookies the recipe made as is and I needed at least 3 dozen so I doubled the recipe. This came out to exactly 3 lbs. of dough so easy to divide into 3 1lb. balls. I used 40 drops of food coloring for each color which seemed to give me a nice deep color. I split the balls in half again to get 2 rolls using the 10×10″ rectangles. I recommend shaping each chunk of dough into a square shape before putting them in the refrigerator. Makes it easier to get the right shape when rolling. Doubling yielded me about 4.5 dozen cookies (about 54 cookies). I froze the dough for a few hours so that it was easier to cut the logs. Also, I marked 10×10″ on a piece of parchment and rolled the dough out using that as a guide. Using parchment reduces the amount of flour needed to keep the dough from sticking. I only needed to flour the rolling pin. When the red dough was rolled out, I transferred it to another sheet of parchment and rolled the next two sheets of dough on the marked parchment. This made it easy to line up the sheets since each sheet of dough will stick to the marked parchment until I peel it off. Once the slices were on the baking sheet, I sprinkled coarse white sugar crystals over the top. This made it a little more festive but didn’t hide the gorgeous pinwheels. These were a big hit at my cookie swap. 🙂 Thanks for the recipe! These are definitely worse the extra effort. Love them, they are beautiful! I baked these tonight and they came out perfect – in presentation and taste. I followed the directions to the T. The hardest part for me was rolling out into 10×10 squares. The dough softened quickly after removing it from the refrigerator and it seemed really thin. But I was generous with the flour, as indicated, and just kept going. Once I got them layered it was pretty easy to roll. I had read through the comments and saw that using a paper towel roll was recommended to keep the round shape while in the fridge – worked like a charm. I ended up leaving them in the fridge for slightly over 24 hours. The dough cut very easily. Baked for 13 minutes the first batch, but found that 12 was better. I got about 37-40 cookies. Does the dough goes in the freezer or refrigerator? Will these do okay if I leave them in the freezer for a week or so before I bake them? Wanting to know this as well. Thanks! I tried your pinwheel cookies and after I made the roll and put it in the freezer it all flattened out on one side. They tasted great but weren’t very pretty. I have had the same problem with other cookies in the past. HELP! How do you keep the rolls nice and round??? Put it in a paper towel tube slit up one side. How about standing them on end in the freezer? (Or put them straight up into a very tall glass until ready to use.